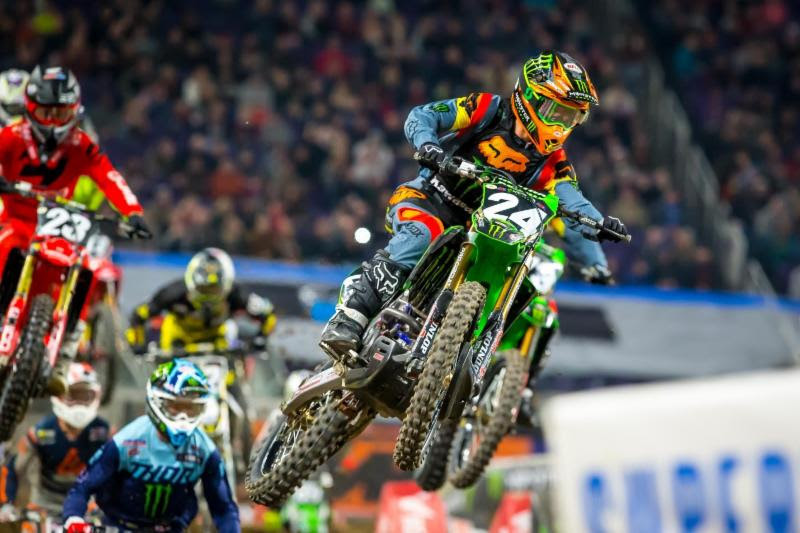 Minneapolis, Minn., (February 10, 2019) The weather was below zero outside but inside the U.S. Bank Stadium in Minneapolis, Minnesota the temperature was plenty warm for 47,421 fans because the Monster Energy AMA Supercross, an FIM World Championship racing was hot. In the 450SX Class Red Bull KTM’s Cooper Webb racked up his third win, the only rider in the class with more than a single victory after six rounds. 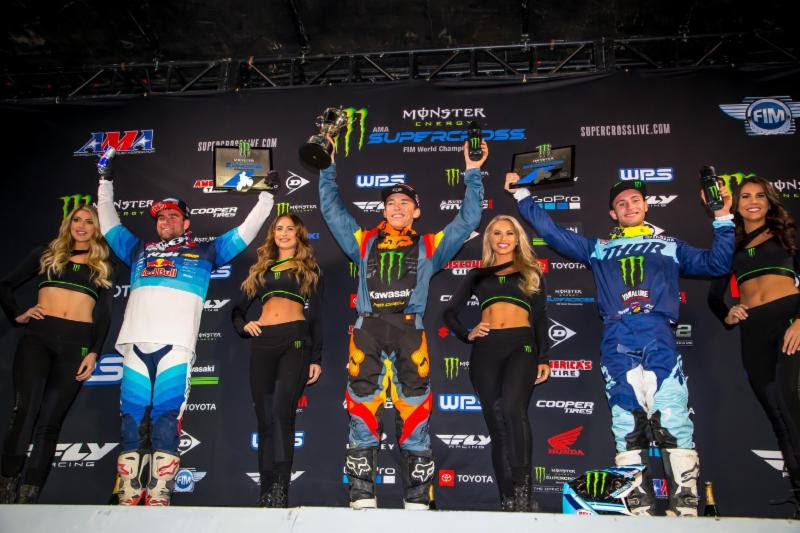 The Minneapolis venue marked the beginning of the Eastern Regional 250SX Class series, where Monster Energy/Pro Circuit Kawasaki’s Austin Forkner put himself atop the results sheet and therefore the points lead. Minneapolis also played host to the launch of the philanthropic partnership between Feld Entertainment and St. Jude Children’s Research Hospital where more than 100 Supercross athletes and influencers kicked off a fundraising and awareness campaign that will be showcased during each of the 11 remaining races through on-air, digital and social media promotion. 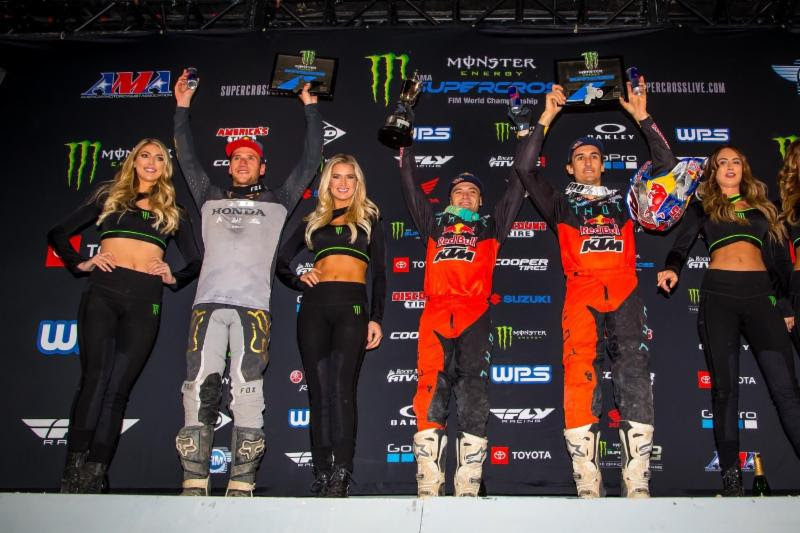 The total funds raised for St. Jude during the season will be announced during the live broadcast of the 2019 Monster Energy AMA Supercross Championship, an FIM World Championship, at Sam Boyd Stadium in Las Vegas on May 4. About Feld Entertainment, Inc.:Feld Entertainment® is the worldwide leader in producing and presenting live touring family entertainment experiences that bring people together and uplift the human spirit. Properties include Monster Jam®, Monster Energy Supercross, Disney On Ice, Disney Live!, Marvel Universe LIVE!, Sesame Street Live!,DreamWorks Trolls The Experience and Jurassic World Live (coming Fall 2019). Across the brand portfolio, Feld Entertainment has entertained millions of families in more than 75 countries and on six continents. Visit feldentertainment.com for more information. About the American Motorcyclist Association:Founded in 1924, the AMA is a not-for-profit member-based association whose mission is to promote the motorcycle lifestyle and protect the future of motorcycling. As the world’s largest motorcycling rights and event sanctioning organization, the AMA advocates for riders’ interests at all levels of government and sanctions thousands of competition and recreational events every year. The AMA also provides money-saving discounts on products and services for its members. Through the AMA Motorcycle Hall of Fame in Pickerington, Ohio, the AMA honors the heroes and heritage of motorcycling. For more information, visit americanmotorcyclist.com.